Happy Easter! We had such an excellent weekend at Clearview Church! So many people came out to our Sunrise service and even more to our 11:00 Easter service! Remember this week that Christ is the Risen Lord. That means we obey Him no matter what! This week’s message on the name of Christ was met with very encouraging enthusiasm! 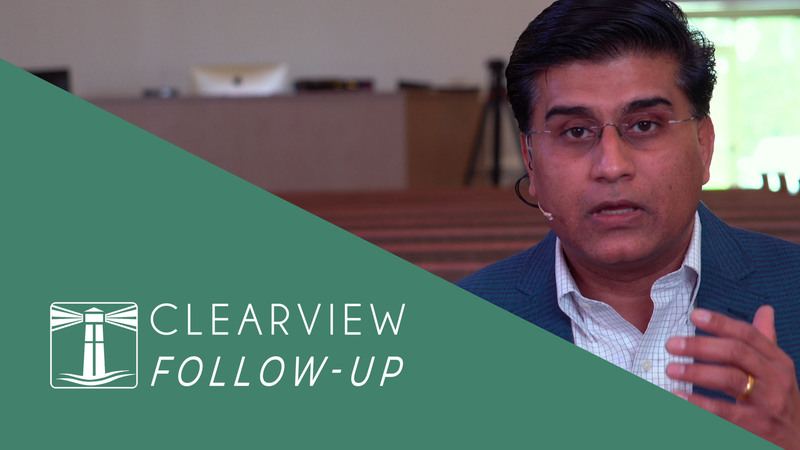 These new segments, the Clearview Follow-Ups, are designed to help you remember the message as you navigate through your week! Thanks so much for listening and be sure to share with someone who needs a reminder to stand firm this week! Introduction: How many of ya’ll remember telling your parents – “You just don’t understand.” How many of ya’ll have heard those same words from your kids? Why do we say that? Because we think that our struggles are so unique that unless others step into our shoes, they’ll never understand what we’re going through. It’s not just parents and kids who do this but employees think that their employer doesn’t understand and employers think that their employees don’t understand. The husband thinks that his wife doesn’t understand and the wife thinks that her husband doesn’t understand. I love the Peanuts cartoon. In this one, Lucy is at her psychiatric booth and Charlie Brown tells her that he has deep feelings of depression – “What can I do about this?” Lucy in her typical manner says – “Snap out of it! 5 cents please.” I would say that she didn’t understand! Today’s message is to help us see that even if people close to us fail to understand us, there is one person who always understands us and his name is Jesus. The message is titled “Likeness” in our series called MIND (RE)SET from Philippians 2. Question: Do you feel that people don’t understand you? Do you often say, “No one knows what I am going through?” Do you know Jesus? Are you saved? 3. Jesus was essentially humanjust like Adam before Adam sinned. Question:Was Adam a full-fledged human being before he sinned? Yes.Genesis 1:27“So God created man in His ownimage; in the image of God He created him; male and female He created them.”Jesus was just like Adam in his humanity. Can we draw a connection between Adam and Jesus?Romans 5:14“…Adam, who is a type of Him who was to come.” Another Question:Did Adam have a sin nature before he sinned? No. He did not have an earthly father to pass down the sin nature to him. Neither did Jesus. Keep in mind that Adam was the created son of God, as noted by Luke 3:38and Jesus was the only begotten eternal Son of God. Both Adam and Jesus were internally innocentand both of them were externallytempted. While Adam fell into sin, Jesus did not. By the way, Jesus was much more than just Adam.Unlike Adam, Jesus was fully God and hence he could not sin. 4. How are we like Jesus then? While Adam and Jesus were essentially human, we are commonly human. We are the product of the union of our earthly fathers and mothers and we carry the sin nature in us. David says in Psalm 51:5“Behold, I was brought forth in iniquity, and in sin my mother conceived me.”Paul affirms in Ephesians 2:3that we were“by nature children of wrath…” Hence, there is a difference between our temptation and Jesus’ temptation. Jesus was tempted only from the outside and we are tempted from the inside and outside. Nonetheless, propensity to temptation and sin does not make us human. Being created in the image of God with a body and a mind makes us human. Are you hungry?Jesus understands hunger. He spent 40 days and 40 nights fasting in the wilderness. Are you exhausted?Jesus understands being tired. Mark 6:31And He said to them, “Come aside by yourselves to a deserted place and rest a while.” For there were many coming and going, and they did not even have time to eat. Are you angry? Jesus understands anger. When the Pharisees tried to use the sickness of a man to trap Jesus into healing him on the Sabbath, Jesus was angry. Listen to Mark 3:5And when He had looked around at them with anger, being grieved by the hardness of their hearts, He said to the man, “Stretch out your hand.” And he stretched itout, and his hand was restored as whole as the other. Have you dealt with abuse? Matthew 18 5Whoever receives one little child like this in My name receives Me.6 “Whoever causes one of these little ones who believe in Me to sin, it would be better for him if a millstone were hung around his neck, and he were drowned in the depth of the sea. Are you having family trouble?John 7 3His brothers therefore said to Him, “Depart from here and go into Judea, that Your disciples also may see the works that You are doing. 4For no one does anything in secret while he himself seeks to be known openly. If You do these things, show Yourself to the world.” 5For even His brothers did not believe in Him. Are you afraid for your life? John 7:1After these things Jesus walked in Galilee; for He did not want to walk in Judea, because the Jews sought to kill Him. Have you been falsely accused? Matt. 26 59Now the chief priests, the elders, and all the council sought false testimony against Jesus to put Him to death,60but found none. Even though many false witnesses came forward, they found none. Are you in physical pain? John 19 1So then Pilate took Jesus and scourgedHim.2And the soldiers twisted a crown of thorns and put iton His head…” And then they crucified him between two thieves. I can go on and on. The point is that he understands whatever you are going through. Introduction: Have you ever been in a situation where you thought you knew someone and they turned out to be a whole lot more? It’s happened to me many times but last year it happened when Nicole and I would go to this store where when we first started going there, two guys would wait on us. One was a very outgoing salesman and the other was kind of soft-spoken guy who hung around. Then there was a third guy there who was typically behind the counter with another salesman. We thought that the obviously the one behind the counter with the other salesman was the owner, the outgoing guy was the main salesman, and the quiet guy was just a trainee. One day the “trainee” wasn’t there and so we asked if he had quit. They said, “Oh no, he is the owner’s son!” Who we thought was the least important person there turned out to be the most important person!It changed the way we interacted with him the next time! So also, many people have a very limited and even misguided view of Jesus. But, when we truly see him for who he is, it changes the way we think about him, worship him, and obey him. This is the second part of our message titled “TRUE ESTEEM” in our series on Philippians 2:5-11. Question: How do you see Jesus? If you and I are to have the mind of Christ, do you know what the mind of Christ is like? If you truly see him for who he is, it would change the way you think about him, worship him, and obey him. Do you know him? Context: As you know, we are in our series called “MIND (RE)SET” where we are learning how to have the mind of Christ. The last message in this series was called “TRUE ESTEEM.” In this message we began to learn what the mind of Christ was all about. Listen again to Paul in verse 6“who, being in the form of God, did not consider it robbery to be equal with God.” Meaning:Even though Jesus had the same form as his Father (spirit, eternal, and glorious), he did not consider “equality with God something to grasp after.” In other words, Father, Son, and Spirit are coequal in essence but different in roles. The Father is in authority and initiated creation and redemption but it’s the Son who actively created and came to redeem with his life and the Holy Spirit encompasses everything and gives life and power to the creation and to every believer. The Son never tried to usurp, subvert, or sabotage the position of the Father. By the way, this was not just in the past. This is how it will be in eternity. 3. It does not mean that Jesus was a combination of a human and divine nature into a new third kind of nature. This was also condemned by the church as a heresy at the Sixth Ecumenical Council in 680-681. He had to be truly both at all times so he could represent us as man and earn our salvation as God. So, what does it mean that Jesus became man? Listen again to verse 7 “but made Himself of no reputation, taking the form of a bondservant, andcoming in the likeness of men.” What I am about to go over is the traditional, historical, and biblical position held by the Catholic, Protestant, and Orthodox churches on the nature of Christ. We may disagree over other stuff like Baptism, Lord’s Supper, the role of Mary but not this. This is coming out of a Church Council that was held at Chalcedon from October 8 to November 1, AD 451. It also caused a schism between the churches in the east and the west. 1. Jesus is truly human in body and soul just like he was/is truly God in form (essence, nature, and substance). 2. Jesus is two natures, one divine and the other human, and they are distinct with distinct wills. 4. The human nature was without sin. He became completely like us but he did not share our sinful nature. He was dying but not for his own sins. He was dying for our sins. In a sense, he was just like Adam. He was human without a human father. Where Adam failed when he was tempted, Jesus did not. The conditions of the fallen world are there but He stayed pure all the way to the cross. The Incarnation of Jesus is a Paradox, a Miracle that is greater than the Creation of the World and the Resurrection of Jesus! Invitation: Take time to think about what God has done for you! How amazing and awesome he is! How compassionate and gracious he is! Humble yourself before him. Be saved if you’re not.